It’s all about the proper angle (degrees) and keeping it the same while sharpening. And the choice of abrasive sharpening surface. 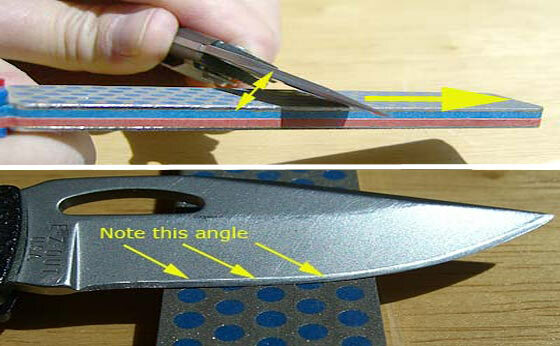 Do you know the proper angle to sharpen your knife (knives)? 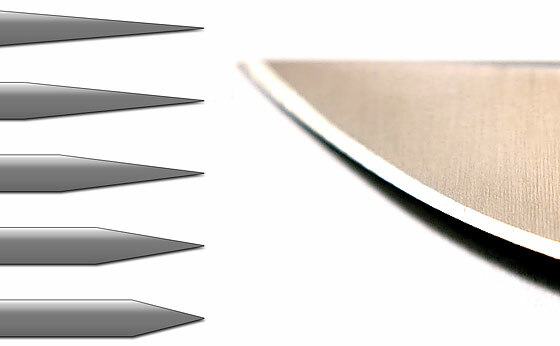 Did you know that depending on the knife manufacturer, and model, that knives have different bevel angles? Every time that you sharpen a knife, you are removing metal from the blade. If you have several different knives (who doesn’t? ), one way to restore a sharp cutting edge is to use an adjustable knife sharpener. Set it to the same angle as your knife edge. An alternative is having a fixed angle knife sharpener that’s permanently set the same as your knife’s bevel angle. How do you know which angle to use? I have found a partial list (below) with some references. However you might contact your knife manufacturer to discover the angle used on your particular knife model blade. Because diamonds are the hardest substance known to man, diamond abrasive knife sharpeners are fast, durable, and very effective. They are very aggressive and remove metal quickly. Premium diamond sharpening surfaces are characterized by a (interrupted) surface that collects and hold the metal filings that ordinarily build-up. 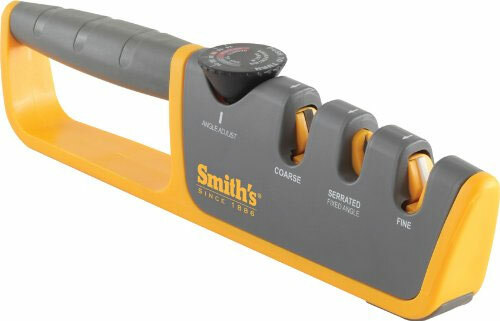 This allows sharpening with or without honing solution. Excellent for use on very hard tools or stainless steel. Diamond stones always remain flat, as opposed to Natural Arkansas and Synthetic stones which wear down with use. They come in multiple grits. Carbide is very aggressive and removes metal quickly. It’s great for quickly restoring a good working edge in 3 or 4 strokes. Unlike other sharpening abrasives, Ceramic removes very little metal. It’s excellent for finishing and maintaining a sharp edge. Ceramic (and ceramic sharpening rods) come in various grits, colors, and shapes. Arkansas stones are genuine silica “novaculite,” indigenous to Arkansas. 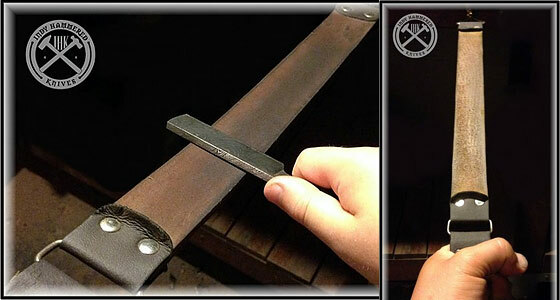 They remove the least amount of metal while polishing your edge to razor sharpness. Man-made stone; great for quick edge setting as well as final finishing. They also come in multiple grits, colors, or shapes. A knife sharpening rod works great due to the fact that every blade has a different degree of bevel or angle. The rod allows you to let the edge guide you, while keeping the rest of the knife away from the sharpening device. A diamond rod is for a knife blade with serious damage or very dulled blade. This is the process in “how to sharpen a knife” where you can get your knife RAZOR SHARP! This is the last step in the process of sharpening knives. Drag the edge backwards over the strop. In other words, it’s a “trailing stroke” by pulling the knife edge rather than “leading strokes” (as you would with a stone or rod). The basic technique to sharpen kitchen knives and a pocket knife is the same as the steps listed above! Here’s a basic method to sharpen a knife! It works! The portable knife sharpener shown in the picture is one that I often use. It has microscopic diamonds embedded in each of the two sides (one side is finer grit than the other). Hold the knife against the sharpening stone at the same angle as the sharpened edge itself. Then push it forward across the sharpening tool while maintaining that same angle. After sliding the knife across the stone, don’t slide it back up against the stone… Lift the knife and start over from the top of the knife sharpener and slide it down across its surface again. More specifically, you should sweep the knife such that you are contacting the entire surface of the blade in one arcing motion down the sharpening tool (therefore sharpening evenly). The longer the blade, the more dramatic the sweep, so as to get the entire blade in one smooth motion. You will get into a steady rhythm while practicing. Apply light to moderate pressure. The key when sharpening by hand (without a jig) is to hold and maintain the knife blade at the proper angle. To determine that angle, it may help to first rest the knife on the edge of the stone. Look closely at the blade’s sharpened edge. Then adjust the knife’s angle until you see that the sharpened edge sits ‘flat’ against the knife sharpener tool’s surface. Without getting into the various differences in proper angle, suffice it to say that ‘typically’ that angle is somewhere around 20-degrees. So one trick is to first hold the knife at a 45-degree angle against the sharpening tool (easy to visualize) and then adjust the knife to half that angle, which will be close to what you want. – Run the blade through the same number of sharpening strokes on EACH side. NEVER do more on one side. – Never use water as a lubricant unless you are using a diamond media. Stones should always have an oil media applied to them. – Never clean a knife with anything other than Dawn. – Never let a relative “borrow” any of your Arkansas stones. I blew it on the last one. My 5-stone set is now a 3-stone set. If I ever come near that sucker that ‘borrowed’ the other two………. Thanks for the memory- my dad always sharpened our knives using a stone and I remember him always shaving the hairs on his arm! I used to have a German made Puma Hunters Friend. Bought it in high school, took it to Vietnam, Carried on many backpacking and hunting trips and finally retired it minus it’s original sheath that went MIA on a hike off of the Likelike highway on Oahu. I was going to give it to young guy at work who lived for deer hunting. Then I saw what they were going for on eBay. Long story short he did not get the knife and i got a couple of hundred bucks for a knife I paid $16.00 for in 1967. I also made a hundred bucks on a Case boot dagger that was EDC after I got back form Vietnam. One thing I learned is that quality knives appreciated in value. what contributes to the value is having the original box and papers if any came with the knife. Original sheath. Never used and never sharpened. Ironically I had tossed the box for the Case about 6 months before I saw what they were going for on eBay. It took bout $50.00 off of the value. One is none, two is one. If you buy two put one away in a dry place. Don’t sharpen it keep a light coat of oil on the blade and try not to let the sheath get any mold on it. My Puma in mint condition would have been worth between $300.00 and $400.00 dollars which would have been a very good return on the $16.00 I spent on it. On the Puma knives, although the blades are still made in Germany they are now shipped to China for finishing. All sorts of ways to sharpen, i think it boils down to preference, even angles, some guys like the steep angles that a lot of bushcraft and tactical knives come with, personally i like my knives to be Japanese sushi chef sharp so always re grind. My favorite sharpener is my Tormek, but it does have a learning curve, but the slow speed wet stone with the strop wheel is unbeatable for razor sharp results, i have gotten similar results on my 2×72 belt grinde, have belts from 24 all the way down to 6000 grit and a stropping belt, in my leather shop i regularly use sharp stuff, tend to never really “sharpen” any of it, use a polisher with green compound a lot and a small hand strop too, there is no substitute for a really sharp tool! I have used the Slicing Edge Sharpening System With 8″ Grit Wheel and Polishing Wheel – CW1 for over 30 years. Very fast and you can shave with my knives when sharpened. No need to over-think something that is very basic and that pretty much every boy has known how to do since they were 9-years old. It’s even easier these days with all the pre-made sharpeners with set angles. But honestly I think everyone should start out on a basic stone to build an understanding of how to do it. I have many sharpeners with pre-set angles and use them a good amount. But I also use basic stones just about as much. Not so important that you have the latest knife sharpening tech, it’s just important you know how to sharpen a knife, the method is not so important. My Dad (and Grandfather did) use a simple stone and I’m pretty sure few of us have a sharper knife then my dad does. I just prefer to freehand! OK Time to come clean, how many of you carry a knife sharpener on them all the time? I have 2 of them in one of my pockets all the time. I really like the Lansky QuadSharp Carbide/Ceramic Multi Angle Knife Sharpener. Bass Pro (5-miles from Me) sells it for $20.00. It works good. Years ago, a butcher turned me on to using a butcher’s steel to quickly return an edge to a knife. I purchased a pocket steel from a commercial butcher supply business on the outskirts of downtown Dallas about 40 years ago. It looks all the world like a miniature butcher’s steel, about three inches long and made of high carbon steel. I carry it hanging from a belt loop with a carabiner. It returns a quick edge to all my pocket knives if I dull a blade on a bone or other surface. I don’t know if the little buggers are available any longer, but it would hurt me to lose mine. I’ve also have a small diamond surface sharpening rod about the same size that works well, but I always follow it up with the steel for the final touch. I don’t know the degrees of the angles. I sharpen according to the work the knife does. If it gets rough treatment it gets a steeper edge. If it is used for fine work it gets more taper to make it sharper. I sharpen everything by hand. I use a stone for serious sharpening and a steel for touch ups. I have several different stones and steels that I use but none of them are expensive. I will also use leather to put the final touch on one I want extra sharp. If you have good technique you don’t need expensive equipment to put a good edge on a knife, but I have spent MANY hours over many years to develop that technique. Good article Ken. May we have one on sharpening axes next? Great article, Ken!! I was always terrified of sharpening my own knives. I bought some cheapies from Walmart to learn the technique, then built up the courage to sharpen my higher end pieces. Bottom line, I wound up up with seriously sharp and improved Walmart knives and brought my better ones back up to snuff. There are still a couple tactical knives I carry daily that I never use for everyday use and reserve the factory edge for the day I hope I never have to use them. Razor edge systems ultra fine hone is what I use. It puts s razor sharp edge on my knives. I would highly recommend it.